To Cite: Farzanegan R, Farzanegan B, Zangi M, Golestani Eraghi M, Noorbakhsh S, et al. Incidence Rate of Post-Intubation Tracheal Stenosis in Patients Admitted to Five Intensive Care Units in Iran, Iran Red Crescent Med J. 2016 ; 18(9):e37574. doi: 10.5812/ircmj.37574. Background: Tracheal stenosis is one of the worst complications associated with endotracheal intubation and it is the most common reason for reconstructive airway surgeries. Due to various local risk factors, the incidence rate of tracheal stenosis may vary in different countries. 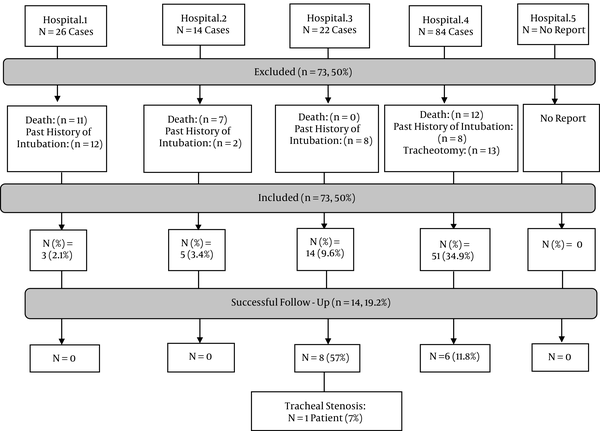 In order to estimate the incidence rate of post-intubation tracheal stenosis (PITS) in patients admitted to an intensive care unit (ICU), a follow-up study was planned. As there was no similar methodological model in the literature, a feasibility step was also designed to examine the whole project and to enhance the follow-up rate. Objectives: To estimate the PITS incidence rate in patients admitted to ICUs, as well as to evaluate the feasibility of the study. Methods: This prospective cohort study was conducted in five hospitals in two provinces (Tehran and Arak) of Iran from November 2011 to March 2013. All patients admitted to ICUs who underwent more than 24 hours of endotracheal intubation were included. Upon their discharge from the ICUs, the patients received oral and written educational materials intended to ensure a more successful follow-up. The patients were asked to come back for follow-up three months after their extubation, or sooner in case of any symptoms developing. Those with dyspnea or stridor underwent a bronchoscopy. The asymptomatic patients were given a spirometry and then they underwent a bronchoscopy if the flow-volume loop suggested airway stenosis. Results: Some seventy-three patients (70% men) were included in the study. Multiple trauma secondary to motor vehicle accidents (52%) was the most common cause of intubation. Follow-ups were completed in only 14 (19.2%, CI = 0.109 - 0.300) patients. One patient (7%, CI = 0.007 - 0.288) developed symptomatic tracheal stenosis that was confirmed by bronchoscopy. The barriers to a successful follow-up were assessed on three levels: ineffective oral education upon discharge, improper usage of educational materials, and difficulties to attending follow-up visits. There were also some important obstacles in terms of human, time, material, and cost resources, as well as data management. Conclusions: To enhance the follow-up rate, three strategies were proposed: patient-focused strategies such as emphasizing patient education upon discharge and providing rewards; structural-focused strategies such as scheduling home visits and uploading questionnaires onto the research center’s website; and provider-focused strategies such as selecting coordinators with good communication skills. All necessary resources should also be re-arranged for a multicenter national study. Endotracheal intubation in patients admitted to intensive care units (ICUs) is performed for many reasons, for example, head injury and attempted suicide, as well as respiratory insufficiency in patients with severe chest trauma, chronic obstructive pulmonary disease (COPD), myocardial infarction, cerebrovascular accidents, cardiogenic pulmonary edema, postoperative acute respiratory failure, and sepsis (1-4). In such situations, it usually takes a couple of days for the patient to be extubated or undergo tracheostomy. One of the most common and most serious complications of this prolonged intubation is post-intubation tracheal stenosis (PITS). The incidence rate of tracheal stenosis following laryngotracheal intubation and tracheostomy has been said to range from 6% to 21% and 0.6% to 21%, respectively (5-9). In a study performed in England, there was an estimated annual population of 30,030 at risk of developing tracheal stenosis, and the incidence rate of post-intubation laryngotracheal stenosis was calculated as 4.6 % (10). Regarding this wide variation in the incidence rates, it seems that the incidence in different countries could be affected by many different local risk factors, including the prevalence of the etiologies and the number of ICUs. Two studies have shown that most patients with PITS experienced up to five days of intubation (11, 12). However, for a patient with dyspnea and a history of tracheal intubation for more than 24 hours, tracheal stenosis should be considered as the first differential diagnosis (8, 13, 14). In Iran, one of the most common causes of fatal injuries is traffic accidents (15). According to a study carried out at Harvard University in 2002, the death rate for traffic accidents was 44 people per 100,000 of the population in Iran, which was the highest rate in the world (16). Due to this high number of car accident victims, a lot of patients are intubated and admitted to ICUs throughout Iran. Some of those who are ultimately discharged will develop PITS. The management of these patients currently involves repeated bronchoscopic dilatations and, in most cases, tracheal resection and reconstruction. This requires frequent hospital admissions and general anesthesia, which causes significant physical, psychological, and economical consequences for both the patients and the health care system. Based on our exceptional experience with more than 2000 patients with tracheal diseases over two decades (17-21), we speculated that the incidence rate of PITS in Iran would be higher than expected. Therefore, we were encouraged to first estimate the correct incidence rate of PITS and then to determine our own risk factors in order to decrease the incidence rate in the country. To the best of our knowledge, there was no similar study or methodological model in the literature. To address this gap, the current study was designed to examine the chosen method, as well as to assess the feasibility of a national study aimed at investigating processes, resources, and management. This study aimed to estimate the PITS incidence rate in patients admitted to ICUs, as well as to evaluate the feasibility of the study. This study was a prospective cohort study involving three months’ worth of patients’ follow-ups after extubation. It was conducted in five hospitals in two provinces (Tehran and Arak) of Iran from November 2011 to March 2013. Although the study finished in late 2013, it took about a year to complete the follow-ups, especially for those patients who did not care about possible risk of tracheal stenosis. For our national study, we selected ICUs that are evenly distributed around the country, with each facility having at least one available ICU specialist and one thoracic surgeon. In this study, as an earlier phase of the proposed national study, we also aimed to evaluate the integrity of the study protocol and processes. To achieve the necessary sample size, five hospitals were then randomly selected from all the included hospitals. The ICUs in the selected general public hospitals had 14, 12, 26, 37, and 17 beds, respectively. The patients admitted to the ICUs were included so long as they had needed to be intubated for more than 24 hours before being discharged from the ICU. They also needed to agree to participate in the study. Patients with a pathology in the central airway, as well as those who underwent any procedure on the trachea, were excluded from the study. Therefore, patients with a history of major airway tumors, direct airway traumas, intubation for more than 24 hours, tracheal surgeries, and tracheostomy or T-tube insertion were excluded. The sample size was calculated as 75 subjects using the arcsin sample size formula when considering α = 5%, a statistical power of 90%, (p1 = 0.21, p2 = 0.06) (5) d = arcsin √p1 - arcsin √p2 = 0.23 (moderate effect size), and the following formula (Equation 1). Considering the likelihood of a 50% drop out sample, we added 25 subjects to the optimal sample size, so that we considered 75 samples in total. At the beginning of the study, a meeting was arranged at our research center for the intensivists and thoracic surgeons, as well as the scientific and executive committee for the project. We then explained and discussed in details the project’s step by step methodology, including the aim of the study, the inclusion and exclusion criteria, the questionnaires and consent form, the warning symptoms, the educational items, the follow-up visits, and the supervision of the whole process by the scientific committee. The intensivists were requested to complete the informational questionnaire (No. 1) in their respective ICUs. Moreover, the thoracic surgeons were asked to complete the diagnostic questionnaire (No. 2) during the follow-up sessions. Questionnaire No. 1 included questions about demographics, the reason for and process of intubation, physical examination findings, habits, drug history, past medical history, and the APACHI II (acute physiology and chronic health evaluation II) score. Questionnaire No. 2 encompassed the patients’ signs and symptoms during follow-up, the pulmonary function test (PFT) results, as well as the bronchoscopic characteristics of the trachea (whenever the test was performed). The informational questionnaire was structured and closed-ended. The questions were selected and confirmed based on a review of the literature and expert opinions (22-25). The questionnaires and the consent form were read and discussed word by word, and any area of obscurity was explained and clarified. We subsequently considered the experts’ points of view in terms of the content and appearance of the questionnaires. The experts were also asked for feedback in order to identify and clarify any possible obstacles or unanswered questions. The intensivists did not experience any problems reading and understanding the questions. In terms of the face validity of the questionnaires, the scientific committee re-assessed each question so as to remove any ambiguity and/or difficulty. The questionnaire was completed in the ICUs. If the patients had to be transferred to other departments before completion of all necessary data, the supervisors (i.e., the intensivists) were responsible for completing the questionnaires in the new departments. At any time during the study, if the intensivists were no longer able to cooperate, they were required to inform the executive committee so that their responsibility could be transferred to another person. All the completed questionnaires were sent to the Tracheal Diseases Research Center by mail. They were all checked to ensure that no section was left uncompleted, particularly the patients’ contact numbers and their follow-up data. The physicians in charge of the follow-ups were asked to be available to deal with the patients’ needs for improveing the response rate. The investigators explained that upon discharge from the ICUs, the patients should receive both oral and written educational materials to help guarantee a more successful follow-up. Moreover, the patients should also be educated about the importance of returning for follow-up when they develop any symptoms or three months after their extubation. The follow-up process consisted of three crucial steps. First, upon discharge from the ICUs, the patients were informed by the intensivists about tracheal stenosis and the associated warning symptoms and signs. They were also notified of the scheduled date for the follow-up and the designated place for the follow-up visit. The patients were informed that they should return prior to their scheduled follow-up time if they experienced any warning symptoms. As the second step, all the patients were supposed to receive an educational pamphlet and a follow-up card upon discharge in order to provide them with more information about the possibility of developing PITS and make them more aware of the need to return for a follow-up. The follow-up cards included the names of the patient, hospital, and the intensivist, as well as the discharge date, follow-up date and place, the name and contact number of the physician in charge of follow-up, the warning symptoms and their primary management, and the contact numbers of the research center’s executive committee. The intensivists were supposed to fill out the follow-up cards. The pamphlet provided basic information about the respiratory tract and tracheal stenosis, a description of urgent management in case of symptom manifestations, a brief overview of the follow-up process, the name and contact numbers of the investigators, and the address of the research center. The third and final step was an office visit with the thoracic surgeons, who were asked to be very careful and active during the follow-up process. This step was expected to take one hour in the hospital. The asymptomatic patients underwent a pulmonary function test and the results were interpreted by a pulmonologist. When the results showed the possibility of tracheal stenosis, the patients underwent a rigid bronchoscopy performed by a thoracic surgeon. The patients who were symptomatic according to the presence of any clinical manifestation of tracheal stenosis (dyspnea and stridor) were also taken to operating room so that a rigid bronchoscopy was performed. The follow-up process was actively started after discharge, continued, and then completed by the office visit. All the patients received reminder calls about 7 - 14 days prior to the date of their scheduled follow-up session. Furthermore, they were reminded that the follow-up visit and all the related procedures were free of charge. In the case of missing follow-up data, the executive research committee at the research center called the patients to arrange a new appointment at the thoracic surgery clinic and remind them or their family members of the warning signs and symptoms. It was again emphasized that the follow-up visits were free of charge. The follow-up calls was repeated if the patients did not attend their scheduled appointments. The study was approved by the ethics committee of the national research institute of tuberculosis and lung diseases (Code: F89125). Accordingly, all patient information, as well as the names of the hospitals and the intensivists, were kept confidential. In this study, we included a feasibility step in order to increase the response rate and improve the assessment of the questionnaires and educational materials. The feasibility-related objectives were categorized into the assessment of the processes (filling out the questionnaires, following up the patients), the resources (human, time, cost, material), and the management of the data, as well as the probable challenges that exist in the different centers. The outcomes of this step were the integrity of the protocol, the rate of eligible patients, the patients’ ICU survival rates, the follow-up rates, and the estimation of the cost, the questionnaire completion rates, and the PITS incidence rate. The collected data were recorded on a database using SPSS analytical software version 16. Data for the continuous variables were expressed as the mean ± SD if distributed normally, or as the median (25 - 75 percentiles) in the case of a non-normal distribution. The categorical variables were showed as the frequency (percentage). To ensure a 95% confidence interval (CI), we used the Jeffreys method. This is a powerful method for estimating the CI incidence of a small sample size. A total of 146 intubated patients were reported (70% men), with a mean age of 41.85 + 18.63 years. Patients with a tracheostomy tube (13) or a past history of intubation (30), as well as deceased patients (30), were excluded from the study. In total, 73 (50%, CI = 0.419 - 0.580) patients were included in the study. Most of the included patients were housewives (26.8%, CI = 0.165 - 0.393) and laborers (28.5%, CI = 0.180 - 0.412). Trauma due to a motor vehicle accident (52%, CI = 0.407 - 0.632) was the most common cause of intubation, and the mean number of days of intubation was 6.92 ± 6.47. The mean weight, height, and BMI were 70.5 ± 15.5 kg, 166.9 ± 16.6 cm, and 25.14 ± 3.7, respectively. The rates of smoking and addiction were 23.3% (CI = 0.147 - 0.338) and 19.2% (CI = 0.114 - 0.293), respectively. Table 1 details the past medical history of the patients. The median of the APACHE II score was 6.78, with a range of 0 - 28. There were six cases with missing data in this section. Based on the APACHE II score, the mortality risk range was 4% -55%, and most of the patients had a similar mortality risk (Table 2). Follow-ups were completed for only 14 (19.2%, CI = 0.109 - 0.300) out of 73 patients. The mean values of the FEV1 (L), FVC (L), and FEV1/FVC (%) for the seven male and six female patients were 2.6 ± 0.77, 3.1 ± 1.02, and 83.4, respectively. None of the flow-volume loops in the pulmonary function tests showed a pattern of fixed airway obstruction. One out of 14 patients (7%, CI = 0.007 - 0.288) developed symptomatic tracheal stenosis that was confirmed by bronchoscopy. However, there was a patient with exertional dyspnea who did not consent to undergo a bronchoscopy. Three (4%) patients were lost at follow-up. Figure 1 illustrates the included and excluded cases, as well as the number of office visits performed in each hospital. Those who did not return for an office visit (56/73, 76.7%) were interviewed over the phone. One was found to exhibit hoarseness during the phone call, but that patient did not agree to come for an office visit. The other patients did not exhibit any symptoms illustrative of tracheal stenosis. In terms of the content validity, the CVI was acceptable (CVI = 0.82). Most of the questions had a CVI of approximately 0.79 or higher. The CVI of the following questions were less than 0.79: occupation (CVI = 0.33), history of cardiac disease and renal failure (CVI = 0.55), history of surgery and immune disease (CVI = 0.66), and alcohol consumption (CVI = 0.55). - All the intensivists had received the questionnaires and carefully considered the inclusion and exclusion criteria. All the questionnaires were completed by them and then delivered to the research committee. - Overall, more than 70% of answers regarding the time of hospital and ICU admission, the time of intubation, and the type of nutrition, as well as more than 20% of answers regarding the date of ICU discharge and the duration of addiction, were missing. - Only 19% of questions regarding the time of intubation had been answered, and all those answers were incorrect because the ICU staff had mistakenly mentioned the date of intubation rather than the time of intubation (i.e., the exact hour, such as 3:00 am versus 3:00 pm). - The intensivists had wrongly recorded all past intubations for surgical procedures as part of the history of intubation for more than 24 hours. - Although we designed the questions to be very simple and concise, we did not consider options like “no data” or “yes, no” in the answer choices for some questions. - Some consent forms were not signed by the patients or their family members. - The research committee received the completed questionnaires through the mail or via a delivery system after a short delay. None of the questionnaires were sent by e-mail. The main investigators and the educational packages were readily available to the ICU staff in the event of any questions or to deal with any problems. However, there were some obstacles that needed to be overcome (Table 3). Human - PFTs were interpreted by a thoracic surgeon rather than a pulmonologist in four hospitals. There was a lack of adequate personnel to follow-up the patients. Time - Although the time spent on filling out Questionnaire No. 1 and the providing the patients with education was supposed to be about 50 minutes, some ICU staff mentioned that they did not have enough time to complete the forms and educate the patients, which resulted in missing data. - The length of follow-up (outpatient admission, taking PFT, and visiting a thoracic surgeon) was longer than expected (> 3 h) for the patients, which led to them missing follow-up appointments. - The completed questionnaires were sent to our research center via the mail, which was time consuming. - The calculation of the APACHI II score took a long time. Material - The format of Questionnaire No. 1 was not user-friendly for either the intensivists or the coordinators. - The nurses who filled out the demographic part of the questionnaire in English preferred to work in a Persian format. - Some hospitals’ architecture was not convenient for the patients to see the doctor, take PFT, and undergo a bronchoscopy because the designated room were located in different buildings and sometimes very far from each other. - The printed map to our research center (the place for the follow-up visits in the capital city) in the pamphlet was not comprehensible for the patients and our colleagues. - The number of landlines and cellular phone numbers given in the written educational materials were not sufficient for contacting the investigators. The patients expressed their dissatisfaction with busy or unavailable lines. Cost There was a budget deficit of more than 30% because of unexpected inflation in our country. - We completed the data entry into the data bank without any problems. As our research colleagues in the ICUs had not completed all the data during the project’s execution, the missing data were not entered into the database in parallel with the project’s implementation, so the data cleaning was not performed simultaneously. - The intensivists either forgot to inform the patients or could not inform them efficiently upon discharge. - The intensivists were sometimes unavailable at the time of discharge. - Some of the intensivists had not informed the research committee about their absences from work or educational rotations, which led to missing data during those periods of time. - Despite our guarantees about the confidentiality of the outcomes, some specialists were very concerned about cooperating with the research committee because they believed that their results might be revealed. The follow-up failure rate was 80.8%. Through a thorough review of the entire process and phone follow-ups conducted by the research committee, the barriers to a successful follow-up were assessed in three levels as described below. During the telephone interviews, we realized that most of the patients had not been efficiently educated at the time of discharge. Most of them were not aware of PITS and its warning symptoms, their follow-up date and place, or the possibility of undergoing spirometry and bronchoscopy. Moreover, neither they nor their family members had been educated about what to do in case of the appearance of symptoms. They had also not been informed that the follow-up would be performed as an outpatient visit and that they might only be admitted in the case of a bronchoscopy being performed. - Most of the patients either did not receive the educational pamphlet and follow-up card or they did not take them home. Only one patient who had taken the pamphlet and the card home failed to look at them. - The discharged patients did not want to return to the hospital. - The patients had forgotten about their follow-up visit appointments. - The patients did not know the place and the date of their follow-up visits due to misplacing their follow-up cards or receiving cards that lacked any date or place information. - The locations for the follow-up visits were often far from the patients’ homes, and some of them could not afford the transportation fees. - The patients were not informed that their follow-up visits would be free of charge and so some of them did not attend the follow-up visits because of financial issues. - The disability or general condition of some patients was the main reason for their failure to attend the follow-up visits. - Some patients who had failed to attend their scheduled follow-up visits were involved in a complicated procedure for scheduling another appointment. - The patients typically did not like to have their appointments scheduled in the morning because of difficulties arranging a leave of absence from their work places. The literature review and our practical experiences showed that most patients with PITS were misdiagnosed and treated for asthma for a long time (26) before finally undergoing an emergency tracheostomy to secure their airways, which actually makes the scenario worse because the treatment involves the resection and reconstruction of the trachea. Therefore, the follow-up of ICU patients with a history of endotracheal intubation is very important for diagnosing PITS, which can lead to severe complications or even death. Although the incidence of tracheal stenosis had been estimated in some studies (5-9), to best of our knowledge there was no similar study or methodological model in the literature for screening these patients. The results revealed that the failure rate of the patients’ follow-up was higher than our expectations and that it was a time consuming process. Regarding the challenges in this study, the following points should be implemented in a multi-center national study to achieve the necessary sample size in the designated time and so to improve the response rate for diagnosing patients with PITS. After the initial data analysis in the current study, we realized that because of the numerous reported obstacles, the number of recruited ICUs had to be increased to achieve the desired sample size in the designated time. Additionally, in our study population we did not find any patients who had a suicide/intoxication attempt as the cause of their intubation. According to previously published studies (17, 18), a suicide attempt was the second most common cause of intubation in patients with PITS. Therefore, investigators should include at least one ICU dedicated to intoxication/suicide patients in order to achieve a more homogenous sample and reach the necessary sample size in the fixed time. Previous studies have revealed that 22.7% of scheduled appointments were missed or cancelled due to different reasons, including psychological disorder, poor socioeconomic status, lack of a certain provider, and the inappropriate location of the healthcare center (27, 28). Although Chariatte et al. described how not all efforts could be effective in enhancing the follow-up rate, some studies have shown that interventions such as a telephone reminder decreased the rate of missed appointments (27, 29). Based on the abovementioned studies, we faced some problems that we tried to solve using different categorized strategies. - In addition to the oral and written education provided to patients upon their discharge from the ICUs, the patients should also be reminded about their follow-up appointments. According to the findings of Cavanaugh’s study, if the interval between the call and the appointment is seven days or less, 69% of patients would attend their follow-up appointment, while in the case of an interval of more than seven days, the figure would be 48% (30). - Incentives such as transportation vouchers or free follow-up visits might increase the response rate due to their effect on the socioeconomic burden associated with appointment-keeping behavior (27, 31, 32). - Although recording the scheduled follow-up date and the names of the clinic and the physicians in charge on the follow-up cards could improve the rate of follow-up by 87% (33), our colleagues did not take care to do so. Thus, we should emphasize such recording during project meetings. - The patients should be informed that they would receive a certification of conflict with work for their follow-up visits. In this way, they could schedule the best time and so not miss their appointments. - Based on previous studies, we believed that receiving an educational pamphlet could increase the follow-up rate (33, 34). As the patients were not well informed about tracheal stenosis and its warning symptoms, the pamphlet and the map to the research center should be improved prior to further studies. The educational material has the potential to change the behaviors of patients regarding follow-up. - It has been shown that different educational interventions such as pamphlets or brochures, telephone counseling, telephone reminders, payment vouchers, and video clips elevated the response rate from 5% to 31% (35). Thus, it seems that an audiovisual educational material such as a video clip can improve the behavior of patients in relation to attending their follow-up visits. - The physicians in charge of the follow-ups should be asked to see the patients as soon as possible for their follow-up visits because the absence of a certain physician could be a barrier to successful follow-up (27). - For disabled patients and those who will not attend their follow-up visits even after a telephone call reminder, it is recommended that future studies should include a follow-up visit at home. To achieve this goal, an expert team and a portable spirometer would be required, and the associated costs should be estimated and provided. - If possible, selecting more appropriate hospitals in terms of architecture may enhance patients’ satisfaction. - In our study, it appeared that the patients were not properly educated about PITS, which might be due to the limited communication skills of the ICU staff. According to the literature (36), the training of staff who are in charge of patient education could be effective in enhancing adherence to follow-up appointments. Therefore, selecting nurses with good communication skills and good working relationships with the intensivists should be a key point in the national study, which may help to guarantee the patients’ education upon discharge, as well as the completing and sending of the necessary forms to the research center. It could also help to persuade the patients to return for follow-up visits (37). - Not only should the supervisors and coordinators attend the scientific and executive committee meetings, but an online scientific group should also be developed as a more convenient means of achieving effective management and quicker communication with the research team at any time. The CVI of the informational questionnaire was acceptable. The questions with a CVI of less than 0.79 were kept in the questionnaire based on the experts’ opinions. They believed that a serious past medical history and alcohol consumption could influence the arterial hemodynamic, which might result in ischemia in the trachea. In order to improve the quality of the completed questionnaires, various strategies were suggested and implemented. - Questionnaire No. 1 was translated into Persian, which was the mother tongue of the coordinators. - The format of the questionnaires should be improved so that they could be filled out in a shorter time. The questionnaires, which were designed based on the literature and expert opinions, should then be validated again. - In the interests of better time management, the questionnaires should be uploaded onto the website of the research center so that they can be filled out online. - Informative guidelines on answering to the questions should be written to provide more clarity and prevent missing data. - A pulmonologist should interpret all the pulmonary function test results at the research center. - The confidentiality of the data and the use of codes instead of the names of the hospitals and research colleagues in the ICUs should be frequently emphasized to the research team members. This study was a multicenter, multidisciplinary study. In addition, all the resources and tools were initially assessed before we developed some practical solutions to deal with any identified difficulties and obstacles. Our study did, however, have some limitations. The number of patients lost to follow-up and the very time-consuming research process in some centers exceeded our expectations for such a prospective study. Therefore, we were unable to interpret some of our findings. In addition, due to a budget deficit, we could not test the effectiveness of other educational interventions such as an audio-visual item in enhancing the follow-up rate. This feasibility study could be used as a model and the first phase of a national study conducted in Iran to determine the true incidence rate of PITS, as well as the possible risk factors, which are still unknown in our country. It also helped us to predict any potential obstacles to the study and hence made us better prepared for a large scale national study. We gratefully acknowledge Homeyra Yazdinejad (anesthesiologist) for her advice on the questionnaires, as well as for her help with this study. Authors’ Contribution: Study concept and design: Mohammad Behgam Shadmehr, Roya Farzanegan, Behrooz Farzanegan, and Mahdi Zangi; acquisition of data: Roya Farzanegan, Behrooz Farzanegan, Shahram Noorbakhsh, and Majid Golestani; analysis and interpretation of data: Roya Farzanegan, Mohammad Behgam Shadmehr, and Mahdi Zangi; drafting of the manuscript: Roya Farzanegan; critical revision of the manuscript for important intellectual content: Mohammad Behgam Shadmehr and Roya Farzanegan; statistical analysis: Roya Farzanegan and Mahdi Zangi. Administrative, technical, and material support: Mohammad Behgam Shadmehr, Behrooz Farzanegan, Roya Farzanegan, Neda Doozandeh Tabarestani, Majid Golestani Eraghi, and Shahram Noorbakhsh; study supervision: Mohammad Behgam Shadmehr and Behrooz Farzanegan. Funding/Support: This work was supported by the national research institute of tuberculosis and lung disease (NRITLD).